Bernard Engel, of the University of Alberta’s Drama Department, starred in and directed the premiere of Edward Albee’s timeless Who’s Afraid of Virginia Woolf? during opening night on November 10, 1965, back when the Citadel Theatre was located in the now defunct Salvation Army citadel. Outside of the Citadel Theatre in downtown Edmonton. John Hulbert, all the way from Pennsylvania’s Allegheny College, served as the theatre’s first Artistic Director, bringing in everything from Arthur Miller’s Death of a Salesman and Tennessee Williams’ The Glass Menagerie to Lawrence Roman’s Under the Yum-Yum Tree and William Inge’s Come Back, Little Sheba to the Citadel that very first season. 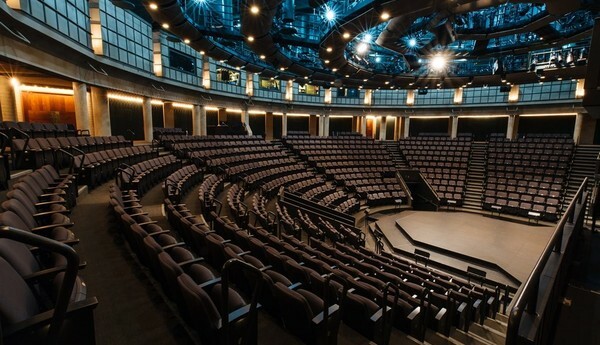 In 1976, the theatre uprooted and moved downtown onto a corner of Sir Winston Churchill Square, where it has remained since, in the now iconic glass and brick building with the luscious greenscape that has got to be the coolest pavilion in all of Edmonton. The new $6.5 million playhouse right in the middle of downtown would eventually grow to include five unique performance spaces (Shoctor Theatre, Maclab Theatre, The Club, Zeidler Hall, Lee Pavilion/ Tucker Amphitheatre) that put on about nine plays for over 110,000 people each season, making it one of North America’s largest not-for-profit theatres. The Maclab Theatre is just one of the venues at the Citadel. And the Robbins Academy at the Citadel just so happens to be Canada’s most comprehensive program for creative development in professional theatre, setting them apart from other theatres across the country. The Citadel is, and always has been, focused on giving back to the community, and not just in the form of world-class productions of some of the most beloved plays ever written: they allow more than 100 different organizations to utilize their space for all kinds of events; they donate hundreds of tickets each season to nonprofit groups for use in fundraising or simply for clients and volunteers to take in a show; and every year, the cast of A Christmas Carol collects food and monetary donations for the Edmonton Food Bank, coming up with some $700,000 since the tradition began.